The FLOWBEC unit uses a vertical swath imagenex 837B Delta T and a vertically-mounted Simrad EK60 multi-frequency echosounder. The imagenex Imagenex active sonar is used for target tracking, classification and observations of behavioural responses of fish, diving seabirds and marine mammals. The vertical swath orientation of the Imagenex gives coverage of the full water column, but with a relatively narrow horizontal band, which will not cover the full swept area of the turbine. The vertical swath and position (upstream/downstream of the turbine) means the unit can monitor the full water column, tracking targets above and below the rotor swept area and on their approach/departure from the turbine. The platform is positioned to optimise measurements of targets around the turbine to monitor the ecological relevance of wake/turbulence, potential prey/predator aggregation effects and target behaviour immediately before/after a turbine encounter in the context of the potential for increasing/decreasing collision risk. The EK60 echosounder operates at 3 frequencies (38, 120 and 200 kHz) and is used for target classification (i.e. debris, fish, diving birds, mammals etc. ), species identification for those species with known frequency response, and abundance estimates at all depths throughout the entire water column. At this point, species with known frequency responses include commercial fish and auk (seabird) species. 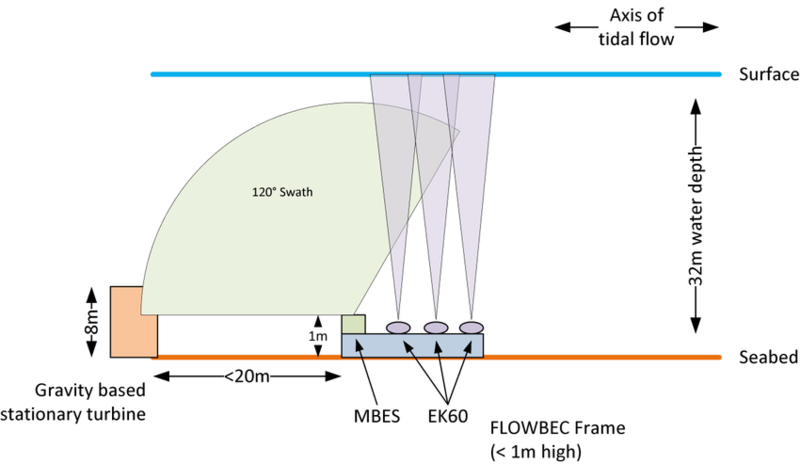 One benefit of concurrent operation of the EK60, multibeam sonars, TTG/TSS cameras, PAM and seal tagging is that it allows classification relationships to be transferred between instruments to some extent, to support later operation with a reduced instrumentation suite, and to provide resiliency in case of instrument failure / degradation. The EK60 information (especially the 200 kHz) is also used to identify ecologically-relevant hydrodynamic and turbulence characteristics to mask from ecological data, and to provide contextual / explanatory information as explanatory variables in the predictive models of collision risk. Co-registration of targets observed on the two complementary instruments (Imagenex and EK60) provides the most information on target behaviour together with identification, for confirmation on co-registered video data when visibility permits. Algorithms have been developed for target detection and tracking of all targets, including fish, seabirds and marine mammals. Classification of targets can be completed using a combination of methods. The data can be interrogated for thresholds of target morphology (size, shape, target strength etc.) and behaviour (velocity, position in water column, profile etc.). Target classification and detail of individual species identification can also be carried out in combination with the EK60 data using known frequency responses for different fish species, and in combination with video data when visibility permits. The collection of concurrent data across instruments during phase 1 will inform further identification of seabird and mammal species. Algorithms have also been developed to define a range of turbulence characteristics from EK60 data and to be able to remove turbulence features while leaving the biological data in the water column over all speeds of tide, enabling analysis of animal behaviour and predator-prey interactions at all tidal speeds, all depths and all times of day. Pentland Firth Meygen AR1500 FLOWBEC Platform Multi-beam and Echosounder Data is located in United Kingdom.